In case you missed it, you can read my version of Mennonite Meets Mr. Right on this blog post “How We Met: CareBearCliff” published in 2013. Have you read any of Janzen’s books? Does your response match mine? Any other memoirs to recommend? How can I possibly take a pass on this book? There’s NO WAY I’m going to miss out on the FUN! It’s a great read, Laurie, with enough passing comments about Mennonite life to justify that word in the title. Since I’ve read your post this morning, I have been thinking about the word sleuth – I think I will discuss skittish chameleons on our lanai. By the way, congratulations, you are “numero uno” with a comment today. Thank you! I have read both of Janzen’s books. I must say that if we compare her work to that of Anne Lamotte’s, I prefer the latter. I find Lamotte’s words more convincing, more genuine, more sincere. 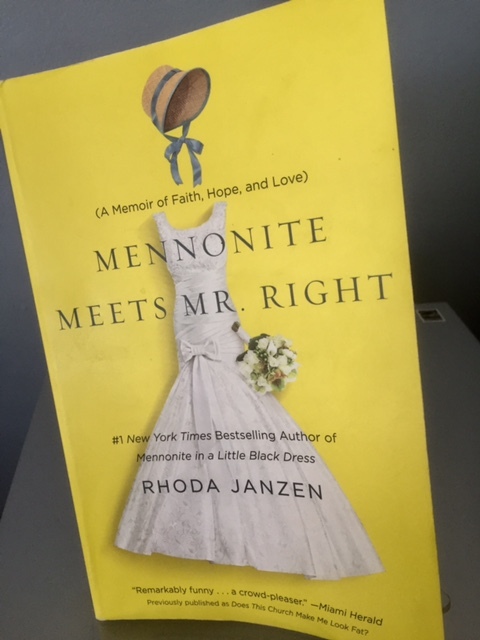 The change from “Mennonite in a Little Black Dress” to “Mennonite Meets Mr. Right” was a bit too jarring to be convincing. Also, I found the biting sarcasm toward family members somewhat unfair. Elfrieda, Janzen’s stock in trade is the comedic style. Thus, at times she may come across as sarcastic, but I hadn’t thought of it that way in regard to family members. Possibly Janzen sacrifices authenticity to be entertaining. I do agree that Lamotte’s work is more devotional and perhaps in that sense more convincing. Thanks for pulling the discussion in a different direction. It will be interesting to see if other readers echo your opinion. I haven’t read Nora Ephron nor Anne Lamott, though I know they are highly respected writers. Nora Ephron I believe is more ‘funny’ … Lamott more serious. It sounds as if Janzen has a bit of both? I like her question and her own response about suffering. You are right, Susan. Janzen, Ephron and Lamott have disparate writing styles and in some ways are not comparable. However, as you concluded, Janzen comes across as both funny and serious. In her rollicking narrative, she explores her evolving faith along with the meaning of suffering, hardly frivolous topics. I never heard the song you refer to. Maybe I can find it on YouTube or iTunes. Thanks for your enlightenment here, Susan. Janzen sounds like she has a very engaging style. Thank you for the review. You’re welcome, Merril. This post started out as a book review only. Then I remembered that a blog post I had written years ago paralleled Janzen’s title, and so it went from there. Janzen’s book may be a quick read when you want to take a break from encyclopedia editing and test-question writing. Thank you for commenting here and on the old post. Your own love story intrigues me and it all began with a Whoop. The Holler must have followed – ha! In my downsizing mode, the library is my first source for books these days too, and I would have checked out our library copy if kind Marcia hadn’t sent me the book. Your “The Right Wrong Man” is on my Kindle. You’ll hear me from me about that soon. Thanks, Pamela. Janzen’s memoir sounds like a great read. “Mennonite Meets Mr. Right, could be recast as Egg-Head Mennonite Intellectual Meets Pentecostal Hunk Mitch.” LOL! Great review, Marian. My Kindle says I’m 76% through your new release. Melanie and Jackson and Melanie are marching toward the inevitable, I’m sure, but I’m enjoying the twists and turns toward the mark. And I suspect there is more than one second-chance romance in the works. Thanks for showing up here during your busy weeks of book launch. Yes, indeed. In fact, I finished it in two days flat and have written a review. Check your email for a specific message about this, Jill. Well, there is a post about Cliff and me tucked in there as a link, but the main item on the menu is Rhoda Janzen’s book review. I read some of Linda Ellerbee early on and am aware she won a coveted Peabody award. Your memoir style will emerge, as it should, from deep within, and after several drafts. I don’t need to tell you that though, as a seasoned writer. By the way, stream of consciousness is welcome here. Thanks, Melodie! Couldn’t resist going back to re-read your story of meeting Cliff. If I read it before, there was much–much–I’d forgotten but I certainly remember the elephant drawing (and how cute it was) and your surprise. Romance in the air there …! I used the elephant drawing in another more recent post. You have been thinking of that one – or not. I’m glad you got to savor it again, or for the first time! I love the question “if we didn’t suffer, could we still be human? I had never thought that suffering was a requisite of the human condition or species as all animals suffer. I suppose it is the ability to show empathy to those in need that makes us human, but animals also do that. I would rephrase that question as Is suffering a necessity of life? Can we live without suffering? This might make a good topic of conversation and discussion at book clubs as the original question is thought-provoking enough as it is. Thank you for your thoughtful comments about Janzen’s take on suffering. In a Reading Group Guide at the end of the book, Janzen poses some questions that hint at her use of humor as a way to downplay her suffering, specifically a cancer diagnosis. She brings suffering into her memoir on pages 109-110 beginning with the question “Why doesn’t God prevent human suffering?” noting that all major world religions observe that suffering inevitable. She continues, “If we didn’t suffer, we would be unable to choose a response to suffering, and so would forfeit sentience.” Yes, I agree – a worthy book club discussion topic. I am going to see whether our library has Mary Ann Shaffer and Anne Barrows’ book. If it’s in your top ten, I must look into it. I appreciate the tip, Fatima! After her first book I was ready to write off the author. Luckily I read the second one and I’m still not exactly a fan, but I do think she grew up a little since the first one. On the other hand I have gone through a terrible divorce with a similar ex and think maybe she needed to write the first one as therapy. I really hated her descriptions of her family and the inaccurate Mennonite references. Thank you for your straightforward response, Elaine. Indeed, I think her first memoir served as therapy while she took advantage of the theme, gay-husband-deserting-unsuspecting wife, back then a hot topic. Rhoda grew up in a Mennonite household in North Dakota, with ancestry of the Russian-Canadian sort, I believe. Such lineage does not excuse her caustic descriptions of family members but may explain references which I (and others) may interpret as inaccurate coming from a Lancaster, PA Mennonite background. Sounds like an interesting memoir. I am currently assisting a writer friend who is writing a memoir. It is not always an easy thing to write and there is always the chance of offending someone. Some humour interjected helps. I hope yours is coming along nicley. Your friend is so fortunate to have an objective friend and writer by her side. The emotional support is as important as your advice on her manuscript. Because of pressing family matters, my manuscript is progressing by fits and starts. I’ve had one beta read, made changes, and now progressing again revising this draft. Thanks for asking, Darlene. What an enticing review,Marian! I agree with Merril. I too thought your post was going to be about you and Cliff. I remember with fondness that “care bear ” post from 2013. I’m glad you linked back to it so I could enjoy it all over again.Thanks for sharing your engaging review. This was two-for-one day, Kathy. Thank you for reading my love story again. I remember references to Wayne, the love of your life, in your writing. Something about the Marlboro Man, maybe! 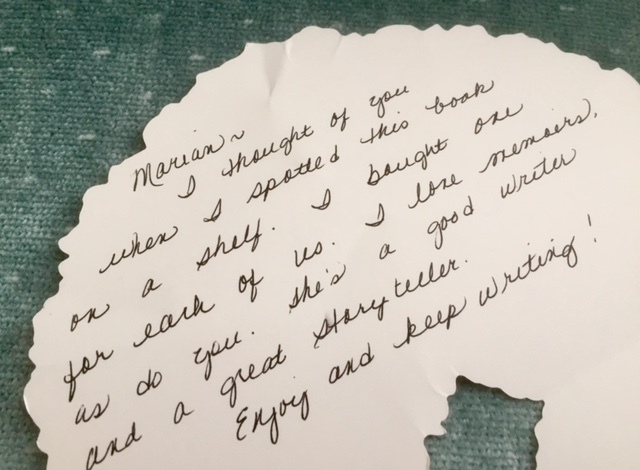 I love your review, Marian, and I’ll putting Janzen’s books on my list of books I’m dying to read. Thanks for the compliment. You know at least two Mennonites, Joan, but Rhoda is not much like either one. Then too, she’s from a different generation. One day perhaps we can compare notes on her writing style, Joan. Both Nora and Rhoda have sharp wits and strong images, both characteristics of a page-turner. I picture you reading in the Arizona sun. You’ve brought some books along – yes? I remember your post way back on meeting your husband ,so lovely . A sense on humour is paramount is it not . Thank you for replying during “one of those weeks.” Yes, I can relate. I read the book because I knew I would zip through the pages with the author’s fast-paced writing style. I read it also because I could relate to it. Besides, it was a gift from a fan. How could I resist? 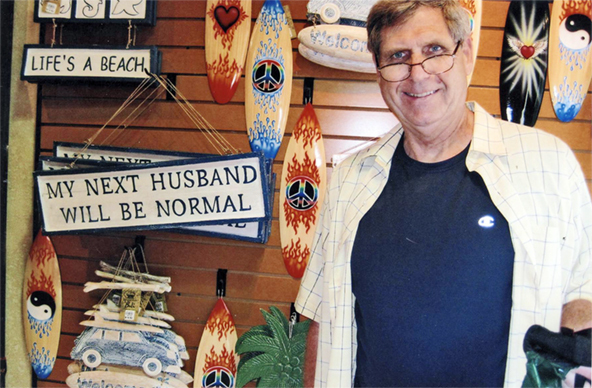 About the sense of humor – essential in a marriage. I rely on Cliff’s sense of humor to help me keep in balance. It’s what first attracted me to him. By the way, your comments are always welcome, knowing as I do that you have to sandwich this in between other things in your busy life. Lovely review, Marian. I read Janzen’s first memoir, and now this one is on my TBR list. I love her wit, her ability to write lyrical prose, and her gift of sharing such personal stories. I wasn’t aware of her poetry and will look for that as well as I shop for this new and exciting memoir. I do remember your post about meeting CareBearCliff. Loved it then; love it now. You know that you and Cliff must come to the Portland/Vancouver area. Meeting Cliff and listening to him talk about his Marian instilled a strong desire to sit with you and talk for hours. So sweet, Sherrey. Now I wonder what secrets he shared. Next week’s blog post contains a reference to you. This reply serves as advance notice! Thank you, Marian, for your kind comments. I love reading memoirs. The last Anne Lamont book I read was “Small Victories,” which included her rant against President Bush. I read, in part, to escape the vitriolic commentary of the day. Another favorite ‘read again and again’ author is Madeline L’Engle. Thank you for sharing your blog with us. I hope to see you sometime soon. Write on! In addition to Anne Lamott, I now know we share a fondness for Madeleine L’Engle. “The great thing about getting older is that you don’t lose all the other ages you’ve been” is a favorite quote of hers I share for birthdays. Thanks so much for visiting today, Marcia. You made possible this post this week, a beautiful thing! Thanks for the book review and recommendation. I was caught by this statement: “I was in a different state now, a weird one, where I’d actually rather have cancer than a grudge.” I get it. That’s the way it was for me with my mother-in-law. I couldn’t keep clinging tightly to my grudge no matter what she chose to do. You’re added another book to my list. And isn’t it the sweetest when a friend you haven’t even met in person sends a book she’s sure you’ll love? And you do. I loved reading about your courtship with Cliff. My trusting and loving partnership, the seeds it planted, and the fruit it continues to produce have been life’s greatest gift. In my view, God’s grace has allowed Virginia to live long enough so you could move past the grudge while she seems to “forget” the negative. The dialogue you preserve as she mellows and you accommodate her is a special gift to your readers. Remember Hawthorne’s Twice-Told Tales? That’s sort of how it is with blogging: joys of the past are doubled and the burden of sorrow is shared. Your comments always inspire me to keep on writing, Elaine, even when strength is small and thoughts seem shallow.